This Townhouse has a premium location just minutes away from your door to the main clubhouse pool and waterslides and tennis, basketball and volley ball courts not too far away also. Relax in your own private, enclosed patio and enjoy Florida sun and sunsets with this premium position. This magical Townhouse will get you in the vacation spirit! With an amazing 1,440 sq. 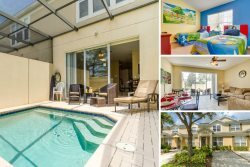 ft. of living space, this large 3 bed/3 bath Windsor Hills home is filled with everything you’ll need on your next Florida vacation. Start your day off with tranquility taking in the tropical surroundings while relaxing in your own private screened ground floor patio. Step inside to the luxuriously decorated and spacious main living area complete with a brand new sofa and comfy love seat, 47-Inch 3D TV, Sony PlayStation 3, all perfect to keep the whole family both comfortable and entertained. From the living room, make your way over to the open kitchen, where you’ll find all that you’ll need to rustle up anything from a quick snack to a gourmet dinner; including stove, dishwasher, microwave, fridge/freezer, and all essential utensils, crockery, and appliances. The attached dining space will be the perfect setting to share stories and enjoy your family meal. At night, get ready to cozy up in comfort in one of the three elegant bedrooms. The master suite comes complete with a king sized bed, walk-in closet and private en-suite bathroom. The second bedroom has a plush Queen bed, while the third has a Bunk with a twin sized bed and en-suite bathroom. Best of all, all bedrooms feature personal cable TVs and DVD players as well as ample dresser and closet space, ensuring everyone has all the comforts of home.